You may have noticed hummus growing in popularity; it is now offered as a spread at some bagel shops and is even commonplace at franchise restaurants. There are many good reasons for this. The thick Middle Eastern condiment is delicious and healthy; it is packed with protein, vitamins, and minerals, and it contains mostly unsaturated fat — unlike most rich dips that are primarily saturated fat. It’s easy to grab some pita bread and a container of hummus at the store, but you only need a few ingredients and you are on your way to making an inexpensive and delicious snack at home. Garbanzo beans and chickpeas are the same thing. Most cans even list both names. Hummus means chickpea in Arabic. While there are many recipes that substitute the chickpea for another bean, it is not true hummus without chickpeas. 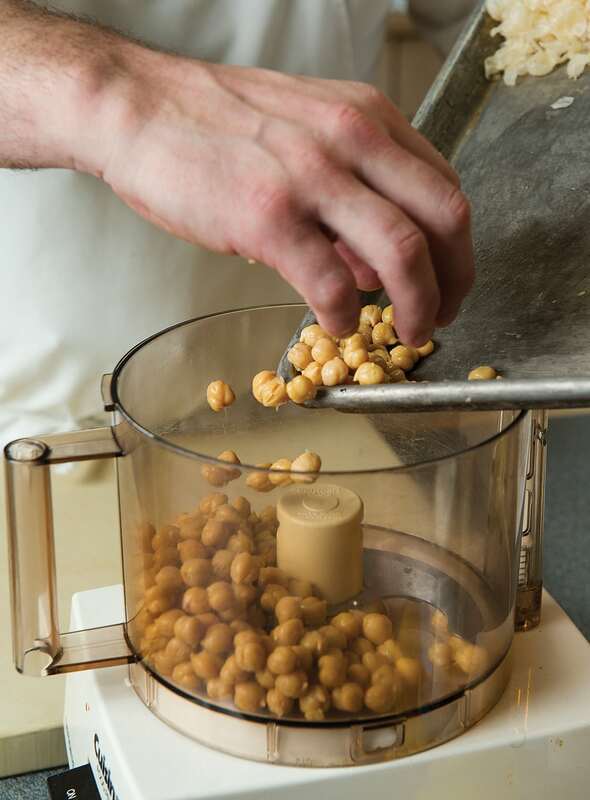 Depending on how much time you have to make the hummus, you can start with dried or canned chickpeas. Dry chickpeas will take about an hour to 90 minutes to cook (shorter if you soak in the refrigerator overnight). They do not take much supervision. Add a pinch of baking soda to help remove the skins after cooking. Reserve the cooking liquid to thin the hummus while blending. Canned chickpeas are ready to go. A few rinses while agitating the beans will help loosen the skins that will dull the flavor if left on and prevent the hummus from becoming smooth. 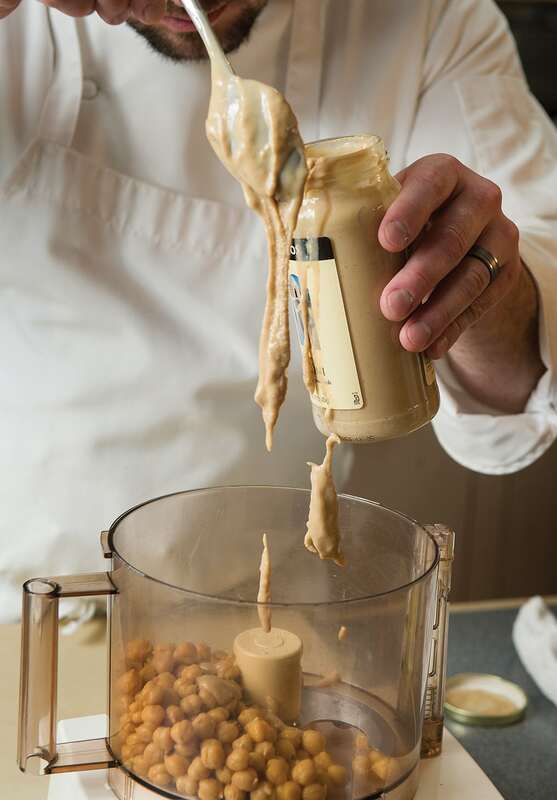 Tahini is a puree of sesame seed that is the consistency of thin peanut butter. It adds a unique nutty taste to the hummus but is also a popular addition to other dishes or as a condiment on its own. Use fresh lemon juice only, please. Other acid in the form of vinegar or bottled lemon juice might work, but fresh juice lends much better flavor and freshness in addition to providing more vitamins. Garlic can be a tricky addition. Without it, hummus can seem a little flat; too much can overwhelm. Use fresh garlic. Even though you are going to puree the garlic, cut in in half lengthwise to see whether it has started to sprout. If there is any green in the center, remove with the tip of a paring knife. Chickpeas do contain some fat, but the addition of olive oil makes the dish richer. You either can pour the olive oil on top of the hummus or mix it in; I like it both ways. I use a little olive oil, in addition to the reserved cooking liquid or water, to thin the hummus while pureeing. This will enrich the spread just enough so I don’t have to drizzle olive oil on top each time I have a snack. 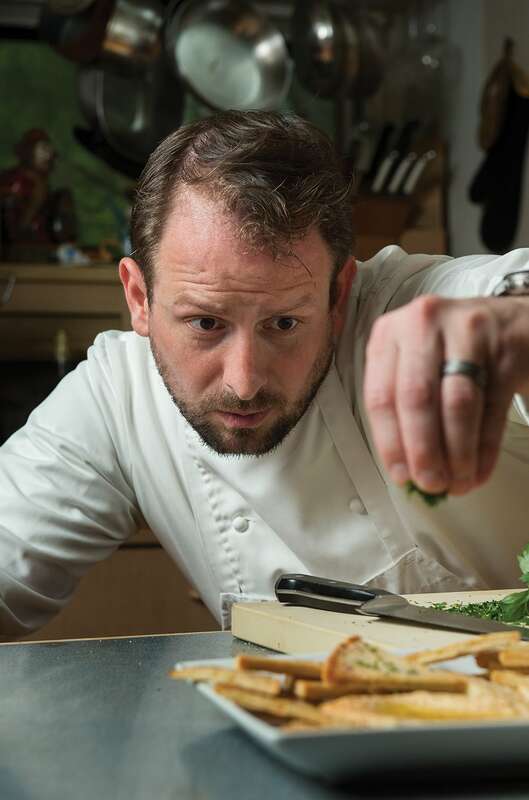 While olive oil alone is the most common topping, herbs, spices and hot sauce can help transform the dish. Just a small amount can turn a single batch of hummus into numerous dishes: add roasted red bell pepper, roasted garlic, jalapeños, cilantro, pine nuts, olives, pesto or sun-dried tomatoes during the pureeing process. Open can of chickpeas, drain liquid and rinse several times while gently massaging to loosen skin. After the water runs clear and is free of foam, pour off water, leaving a small amount in the bottom of the bowl. Check to make sure all the skins have fallen off, gently squeezing any that have not to pop out the pea and remove the skin. Place chickpeas, garlic cloves, tahini and lemon juice into the food processor. Blend until smooth. Scrape sides and adjust with water as needed for a consistency of thick icing. Add 3 to 4 tablespoons of olive oil while the hummus is pureeing. Add salt and pepper — and lemon juice — to taste. Spoon what you are ready to eat now onto a plate (save the rest in a container), drizzle or make a pool of olive oil as desired. Feel free to sprinkle with fresh, chopped flat-leaf parsley, paprika, cayenne, cumin, Sriracha or whatever other topping you would like. Serve with pita bread, pita chips or fresh vegetable sticks and enjoy. Preheat the oven to 350 degrees. Cut pita bread into six or eight wedges; lay wedges on a baking sheet and brush with olive oil. Sprinkle with salt and pepper. Bake for 5 to 7 minutes, then rotate pan. Bake another 5 to 7 minutes and remove to cool. Chips will crisp as they cool. Once fully cool, extra chips can be stored in an airtight container.